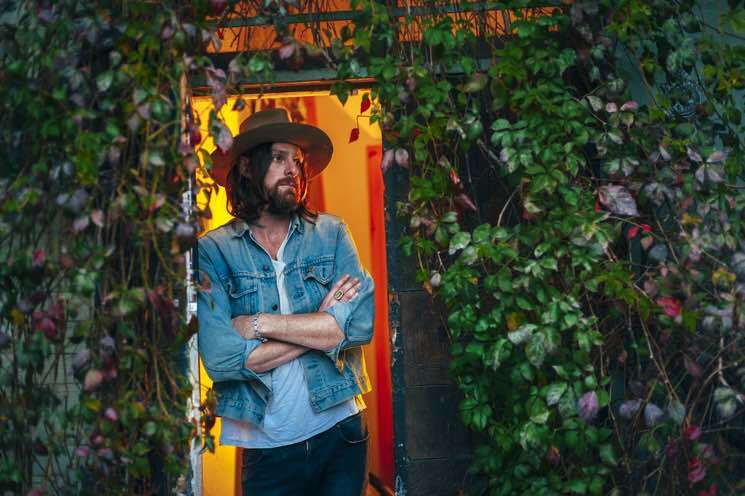 East coast rocker Matt Mays has an extensive discography, from his time as a member of the Guthries to his subsequent work as Matt Mays & El Torpedo. Following the disbandment of that band, Mays won a Juno for Rock Album of the Year for 2012's Coyote. He just released his sixth full-length, Once Upon a Hell of a Time. The record oscillates between soft ballads and raucous rockers throughout and sees Mays soar to new heights. "Howl at the Night" features a unique layering of playful synths and cymbals, while "NYC Girls" conquers pent-up emotions with a party rock twist. Matt Mays confidently considers this "the record I've always wanted to make." I just moved to Toronto — well I've been here for a year, but I live in Toronto now. It's new, interesting and fun. I'm going on tour with Arkells. It's not much of a tour, we're just doing four shows in November. Yeah, it's just sort of seeing if the album sticks and going from there, just letting it kind of call the shots a bit. We'll see after [release day] how she does. The new Queens of the Stone Age is blowing my face off. I know it's blowing everybody's face off. [Also] Tyler Messick, he's a songwriter from the East coast [and] Peaky Blinders on Netflix. I've lived in a lot of big cities. I've lived in New York City for a really long time, I've lived in L.A., I've lived in San Francisco. It's just nice to be in a sort big Canadian city. Toronto's a really weird city. I find it weird in a very good way, so it's just kind of good to be around that. It's contained enough, but it's also quite vast in a lot of different ways. I just think day-to-day it's a pretty rad city to live in. "Surf's Up" by the Beach Boys. I remember being in the front row at a Neil Young concert and during the guitar solo for "Rockin' in the Free World" he locked eyes with me for what seemed like forever, but it was probably only like ten seconds. It was super loud and I was probably about 18 and something kind of happened. I feel like there were lightning bolts coming out of his eyes that hit me in the face. So I've got to say that was it. Career highs would be just how every now and again you hit that point with an audience and your band all at the same time, and it doesn't matter if you're in front of two people or 17,000 at the Saddledome — it's happened both times. When you really lock something down, where you sort of forget everything, and everybody in the whole room has forgotten about their real lives, and are really deep into the music. Those are usually my most memorable times. The ones that are the toughest are just the road. Losing friends to the road, losing true loves or relationships. There's a real vast difference between the two obviously, but I think if you play in a real band you know both quite well. Geez, how much time do you have? There are so many. I remember one time a guy just said: "Mays, your hair looks stupid!" I don't know why it stuck with me, because you don't listen to guys like that, but then I was like "Man, does my hair look stupid?" I kind of fell for it, and my hair probably did look stupid, but whatever. This was like, last year. It was an in-between hair phase, it wasn't my fault! Everybody should shut up about how good paying for extra leg room is on commercial airlines, because when you're 6'4" you shouldn't have to pay for extra leg room on an airplane. Everybody always gets free leg room when you're under 6 feet tall. I have to pay $40 to sit on an airplane. For me it should be like one of those things like at the fair, where if you're over or under a certain height you can or cannot go on the ride. I think that if you're over a certain height and you prove it, then they have to give you free leg room. I think that's fair and I'm fighting for it. I think I like and dislike the same thing about myself — I tend to like to have a good time, which is sometimes the best part and also the worst part of me. So therein lies the balance I suppose. I love having a good time, and I think I show a lot of people a good time, but also it keeps me from my work. Probably surfing with my buds at home. Surfing in the morning or really at any time of the day, and then going out for a nice dinner. I like having Sunday dinner with my folks or my family or my sister here in Toronto. It always has to have something quite active, whether it's a hike or surfing. Just a combo of doing something outdoors and then having a feast with my family members. I would say to trust my gut and my song. I used to be too scared to trust my gut for a long time, and I didn't, and I made a lot of decisions that were probably not as good as I thought they were based in knowing full well what my gut was saying and not listening to it. I have a saying where "the heart is sometimes right, the mind is sometimes wrong, but the gut feeling is always right" but that's not my saying, I fucked it up, but it's something like that. I should have listened to my gut on a creative level a long time ago, but I'm just starting to do that now. Yeah I have. As far as the band goes, it's a bit of a Darth Vader vibe where it's like, 'Your lack of faith deters me.' It's a really hard thing being in a band and if anybody shows any signs of doubt, they don't usually come back. It's a thick and thin sort of situation. In bed I don't like getting cold water spit on me. I get that some people dig that. Surfing all winter, cold water is something that I don't find pleasurable. It doesn't get me going. It's full shutdown mode at that point. I think of freedom. I've travelled the world and I've been very blessed and very lucky to do that and I get home and I feel even more blessed that I get to call this my home country. It's such a free nation, even geographically it feels very freeing here, socially its designed as one of the freest countries in the world and I like that. It's something that's impossible not to be proud of and on top of that to play for an represent, I feel very lucky. License to Ill by the Beastie Boys. When I was a kid I went down the street and got that on cassette. I worked as a surfing instructor in Nova Scotia and that was probably my best job on many, many levels. Cinnamon Toast Crunch and homogenized milk. Probably renting jet skis in Barbados. I fear a lot of day-to-day stuff. I'm just kind of scared about life a little bit. I like to be on my own or on stage. I have anxiety so it's something that I'm working on. Transactions with humans kind of freak me out. I think anybody who has a good laugh at watching Super Dave Osborne. If someone can have a really good laugh at that sort of comedy [that] would just be a good time, which would lead to other things hopefully. The strangest and funniest would be riding in the back of a cab with my all-time sports hero, Kelly Gruber from the Toronto Blue Jays. We both had our sunglasses on upside down, I remember, and we were laughing hysterically. We had a couple too many [and] we were just singing tunes in the back of a cab. It was kind of crazy for me, because he's one of my biggest heroes. When we met, we were just two peas in a pod. I'm gonna say Susanna Hoffs from the Bangles, and I would probably serve her… I have a few signature dishes. I would probably make my bucatini. I make a good bucatini. She probably wouldn't want me doing anything else. I come from a family of artists, they're very supportive. I think maybe a gardener, if anything. I think it would be [Curtis Mayfield's] "People Get Ready" — the Chamber Brothers version.